Note: we do not powder coat aluminium wheels. Powder coat spoked wheels for a tougher finish. Spraying steel wheels whilst refurbishing is a better finish and by powder coating they will be more chip resistant and have better corrosion resistance. Getting your wheels powder coated using the Tri Resin™ System will give them the best corrosion protection and finish. strip and blast the wheels back to grey metal. after the paint is removed the wheels are then inspected for damage. corrosion inhibited the steel with a new generation rust inhibitor. powder prime with waterproof epoxy for a longer rust free life. top coat with an architectural grade polyester to reduce fading and matting. This is an architectural powder coat system designed to last for 15 years in all weathers. 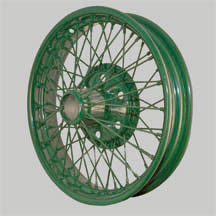 How much does it cost to get wire wheels powder coated? Price for a typical wheel as shown, please allow £55 +VAT. We often receive wheels by post, but it is best to collect them in person. This eliminates any risk of damage by the courier.